Foliage for shade is something extremely important because the textural effects add interest to areas that can sometimes be challenging for the unexperienced gardener. I say “unexperienced” because many newbie gardeners assume shade is just aweful to deal with for plantings, but it is not really. In fact, I happen to feel some of my best planting combinations are areas of various shady conditions. It is a matter of knowing the many options for shade loving perennials, trees, shrubs, and even annuals! First you can start with making sure your shade area has some bulbs for spring blooms, but then focus on showy foliage candidates to help your garden carry its force in the summer to fall months. Add an occassional annual shade lover, such as Caladium ‘Red Flash’, in your garden bed for more interest. Or… as you may expect me to recommend…use a Caladium (ka-LAY-dee-um) and other shade annuals in a beautiful container garden to add a focal point or extra character to your shade bed. Caladium ‘Red Flash’ is hardy to zones 9-11 so treat it as an annual here in CT. It is actually, more technically stated, a tuberous perennial. Caladium is another foliage fav because of its arrow-head shaped leaves, lovely reddish coloring down the center of the leaves, and the blue-green coloring on the outer edge of the leaves. This year, I used it in a container combination for a business client with wonderful supporting partners as shown in this photo. You may notice some of the supporting candidates in this designer container garden are part sun-lovers. Just as in nature, sometimes a canopy exists in container garden areas. You can not see it in this photo, but there is a building overhang above this container garden offering some shade during some parts of the day. In nature, a forest of higher trees can create a canopy of shade as well. As you add shade loving shrubs to your landscape, you offer another layer or level to create rooms and shapes in the space. 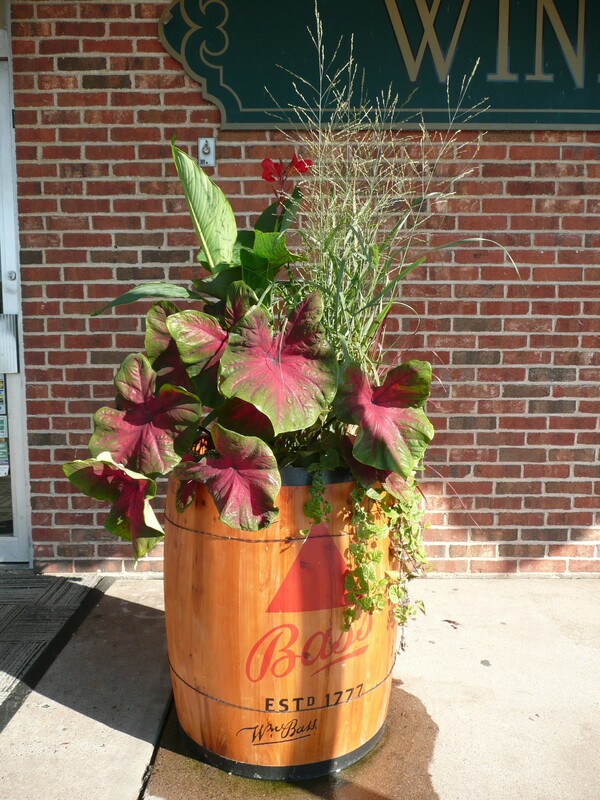 Some of these tricks are achievable in container gardens too! Partial shade are areas which receive about three to six hours of sun a day. Light shade are on the more dappled side. Medium shade are areas that get shade only part of the day based on timing of the day and the season as the sunrise or position changes, and full shade is in places where you get very little to no sun. But who can keep track of all these shade considerations, right?! Well, you can if you desire, but for container gardens, we know a bit of a repositioning can work if you discover your shady candidates aren’t faring well with just a push of the pot! The various shade levels or conditions exist for container gardens depending on placement of your container. For example, shadows cast by buildings or homes or even shadows cast by bigger thriller type plants in your containers can create these environments. All of these aspects are covered in Cathy T’s Container Garden Parties and classes. I show you how to take advantage of the shade considerations and not fight them, or fear them! Other shade tolerant perennials on the list, if you need some help with your shade areas, are: Alchemilla (Lady’s Mantel), Astilbe, Begonia, Bergenia, Brunnera, Carex (grass), Cimcifuga, Epimedium, Euphorbia, Hakonechloa, Helleborus, Heuchera, Hosta, Lamium, Ligularia, Liriope, Polygonatum, Pulmonaria, Tiarella, Tradescantia, and more! All of these are, in my eyes, serve as great foliage candidates for various reasons – whether form, height, structure, style, or color. To learn about shady favorites, when you are ready for help with your garden designs, feel free to contact me.